With the first frosts landing so late in the UK this year, many may have been lulled into wondering that wintry winds and the wearing of more substantial, wool-themed layers, might never come. Intermittent chillier days are kicking in, though, and, as our mild autumn comes to a close and the days shorten, logs are being re-stocked and stacked high to fuel the comforting warmth of wood-burning stoves. And so our attention turns to making home fires safe and attractive hot spots in readiness for the festive season ahead. Fire safety can be applied with some seasonal style as well as function so this blog also touches on 2017 interiors trends. 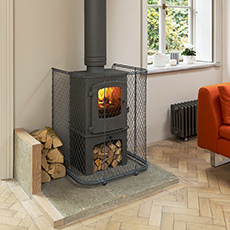 There’s still time, ahead of Christmas, for owners of new wood burning stoves, pets or young children to consider surrounding their log burner with a tailor-made fireguard. We handcraft two styles of fireguard at Garden Requisites. Our Traditional, diamond patterned, woven mesh design is inspired by the Victorian fire guard that graced open fires in nurseries of the 1800’s and 1900’s. Our updated version has solid steel ball feet for extra weighty stability, a design that suits heritage properties and that can be made to measure, as can many of our metal products. John and the workshop team can also forge a more modern, vertical rod design of fire guard, a pleasing object in itself, at home in contemporary interiors as well as mid-century modern and modernised, period properties. The Contemporary Fireguard is carefully constructed with rod spaces that have even been measured to ward off inquisitive pets. Last year was all about the Danish cosy lifestyle concept ‘Hygge’. The antidote to Scandinavia’s deepest darkest winters, Hygge typified the deep sense of warming-to-the-core wellbeing felt when gathered with friends and family in flickering firelight, cupping a hot chocolate in de-mittened hands, feeling the moment right down to toasty toes in snug, soft socks. This year, Vogue’s new year news of a more pared back Scandi trend, Lagom, seems to have eclipsed Hygge’s infectious glow. A Swedish lifestyle concept, Lagom does what it says on the tin. The word roughly means ‘not too little, not too much, just right’. It encapsulates the not-so-new concept of living a de-cluttered, pared back life with the minimum of fuss, taking care to live gently and sustainably with just the right helping of contentment. In interiors terms this means minimal, economical designs delicately intertwined with eco-friendly, close-to nature influences. With roots in northerly climes, when log supplies are sustainably sourced, wood-burning stoves also have a place in this finely tuned way of living. Don some felt slippers and step across to our latest Lagom Pinterest Board for more inspiration. Now to those fire accessories. Take time to select the very best to suit your home’s style. Whilst we have small, medium, large and extra large sizes of fire guard, we can also take bespoke guard measurements to fit awkward spaces, including protruding or standalone wood burners. Just the ticket for barn conversions, extensions and shepherd’s huts. Forged in sturdy zinc-galvanised solid steel, for added safety, wall fixings are also available. To finish, the Traditional Fireguard is available in a Black painted option or Aged Zinc and the Contemporary Fireguard comes in a smart satin, Anthracite Grey. We can also apply bespoke finishes that may better blend with specific interiors schemes. As always, do give Hilary & team a call for any advice and make sure you’re ready to keep seasonal visitors safe this winter. Tell us how you get on with living the ‘Lagom’ life too!